Dave | MSRcast and Metal Geeks Unite! It’s been years since I’ve made it to a midnight release of a movie. Too many responsibilities and practicalities, etc. But, for the return to Middle-Earth with The Hobbit, certain concessions were made. For, you see, I am a Tolkien fan. Of all the many things about which I geek, the works of Tolkien rank one of my most geeked about. I made it to the midnight release of every one of the Lord of the Rings films, and I’m not about to break that trend with the three parts of The Hobbit. I’m thrilled that Peter Jackson was finally able to return to the helm of this project. For years the project was in jeopardy because of a long-standing dispute between Peter Jackson and New Line Cinema regarding royalties owed over the Lord of the Rings films. As a result a number of different directors were considered, and some even hired on for a time, including Guillermo Del Toro, who does end up with a writing credit. But, because Peter Jackson did such a masterful job with Lord of the Rings it seemed unjust that anyone else should get to work on The Hobbit. Whatever understanding was come to with New Line, it was no doubt influenced by the fans of the movies, as well as the actors who appear in both stories, who, from my understanding, banded together to make sure the project was put back in Jackson’s hands. This loyalty paid off. Along with all the necessary actors, Jackson’s creative team also returned. WETA continues to make some of the most beautiful props, costumes, and set pieces in the industry. Alan Lee and John Howe, easily the two most dominant names in Tolkien art, also return to their highly influential role as concept designers. The finely tuned machine that Jackson and company were able to put together for LOTR doesn’t seem to have missed a beat, and everyone stepped right back into their vision of Middle-Earth with an ease that belies the fact that it’s been nearly a decade since they were last there. The Hobbit: An Unexpected Journey is a beautiful film. Now, my Tolkien fanboying would not be complete unless I made a few complaints. These are almost exclusively issues of artistic liberties taken with the story. Jackson took a number of these liberties with Lord of the Rings, and many of them I found understandable as a means for turning three good-sized books into digestible, though still very long, movies. I thought that these liberties would be fewer with the Hobbit, because of the text’s shorter length and less complicated story line. Contrarily, though, a lot of things were added or changed to the story that did not quite sit right with me. One of the most notable examples of this in the movie is the character of Azog, the long-standing enemy of dwarves who hounds the party from the get go. While he is a character from Tolkien lore, he does not figure prominently in the book. It seems that he was expanded as a character in the movie to add a sense of constant threat tying all of the movies together. Azog also plays off the character of Thorin Oakenshield, his fear, jealousy, and sense of vengeance. Smaug sufficiently fulfills a nemesis role for Thorin in the book. Azog seems to have been added to provide an on-screen villain since the party won’t actually be seeing Smaug until late in the second, or possibly into the third film. As such, his addition is somewhat understandable. The other significant change is the character development of Bilbo Baggins himself. In the book, Bilbo’s progression out of timidity and self-doubt is very gradual. In the movie, though, he seems to make great leaps at a time, and he takes actions in the movie that were not his in the book, or throws himself into dangerous situations in ways that he would not until much later in the story. Indeed, through easily the first half of the book, the dwarves have very low regard for Bilbo. I think making Bilbo more heroic early on was meant to endear him to the audience as well as to the dwarves. But this misses the point of Bilbo. He’s not supposed to be heroic. He’s supposed to be the everyman character. We relate to him because he isn’t heroic, because he does prefer the safety and comfort of home. This change could also be rationalized if we consider that what is a short book is being spread across three films being released far apart from each other. I assume Jackson wanted to have Bilbo establish a sense of pride in his abilities by the end of the first film. As with The Lord of the Rings, I will overlook, and no doubt come to accept, these differences because of all of the other things that the movie gets right. The company of dwarves, though, in my opinion, somewhat short on facial hair in some cases, are each given unique appearances and personalities. This is important because in the book the dwarves, except for Thorin, are sort of a collective character, without distinct personalities of their own. In such a visual medium, though, it’s necessary to have each stand apart, even if their roles are relatively minor. I ended up liking the dwarves a lot more than I was anticipating. There are other story additions that I am okay with, as well. The films will be emphasizing the conflict with the Necromancer. This part of the story is not really elaborated on in the text of the Hobbit itself, and it is not directly relevant to the story of the dwarves return to Erebor. However, in the larger scheme of continuity between the Hobbit and the Lord of the Rings, the Necromancer is a pretty pivotal character, though I won’t spoil this for those of you who aren’t as big Tolkien lore nerds as I am. Though the Hobbit was originally written as a self-contained story, the lore was later retrofitted so that events in that story more adequately serve the story of Lord of the Rings. Peter Jackson has tapped into this wider source material, which will help tie this series in more closely with his LOTR films. And I’m pretty excited about that. Disclaimer: this review assumes the reader is familiar with the Half-Life series and discusses several story elements. In short, spoilers ahead. In the unlikely event that this is your first time hearing about it, Black Mesa is Half-Life. Yep, the first one. Unsatisfied with a direct Source port of Half-Life, a number of volunteers from the Half-Life community rebuilt the game from scratch to more effectively make use of the Source engine’s capabilities. And by rebuilt I mean everything. All levels were redesigned; every object and every character was remodeled, re-textured, and reanimated. The voices were all re-recorded with new voice actors. A new soundtrack was written and recorded. This was a massive undertaking and a labor of love that took place over seven years. I played the original Half-Life more times than I can remember, and though it’s been several years since my last play through, much of the game is pretty well seared in to the ol’ grey matter. 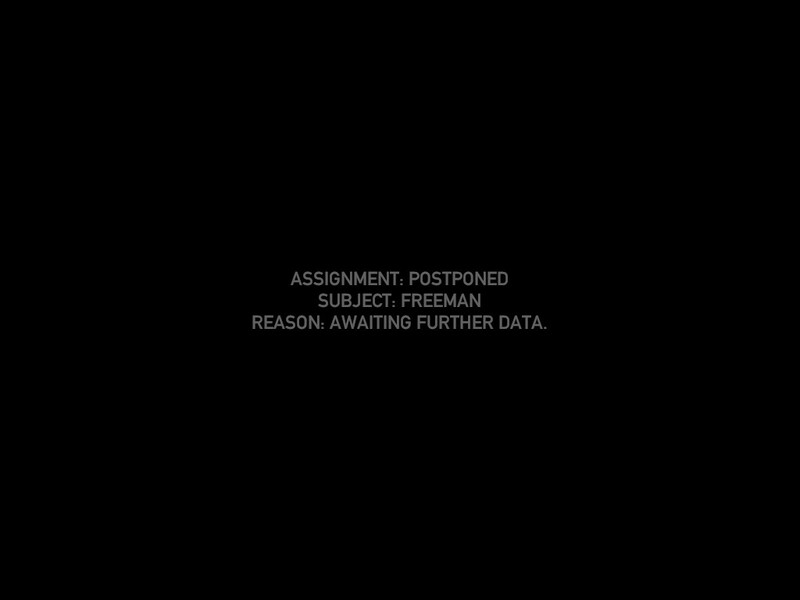 So I felt more than prepared to play through Black Mesa. I enjoyed the tram ride through the newly remodeled Black Mesa facility. I made my way through the Anomalous Materials lab with barely a thought, collecting my HEV suit and making my way to the test chamber like it was a matter of routine. I pushed the sample into the anti-mass spectrometer, and things went predictably haywire. But then something else happened. I realized I was feeling the anxiety of the aftermath of the resonance cascade like I was playing the game for the first time. I was suddenly engaged in a way I wasn’t expecting. I was sold, and I stayed sold for the rest of my run through the game. Black Mesa, it turns out, is much more than just a cosmetic upgrade of Half-Life, but rather a reincarnation of the original, full of its character, spirit, and nuance. And plenty of stuff like this. Gruesome. With the goal being a fresh telling of the story, rather than a precise, mechanical rebuild, the mod team took a number of creative liberties with the game. New dialogue was added. 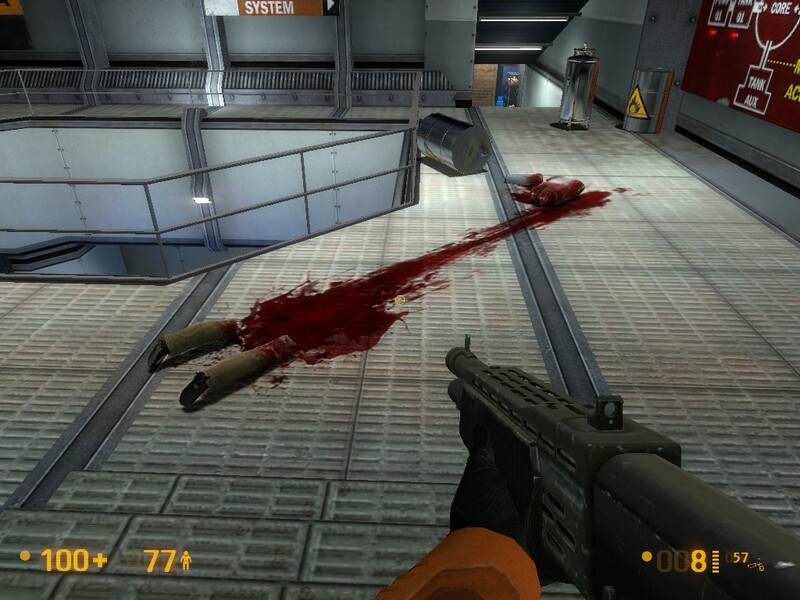 Some of it serves to tie the events of Half-Life into the larger story that has emerged out of the Half-Life universe. For example, during the “Anomalous Materials” chapter, there is a conversation with Eli Vance and Dr. Kleiner that doesn’t appear in the original, but helps lend credence to their characters in Half-Life 2. Some of the other new dialogue shows up in the idle chatter of the NPCs, my favorite of which being the comment from the security guards to Gordon that “I keep thinking you’re about to say something profound.” Changes in level design serve to add believability to the environment, but also cut out some of the more slowly paced parts of the original. The “On a Rail” chapter, for example, is significantly truncated in Black Mesa, but I didn’t miss the stuff they cut. The rocket silo and satellite launch sequence was much more concise. These kinds of changes moved the story along well, and made the game seem to make more sense. Cuts that were made were largely inconsequential to the story, but served to improve game play. Another welcome addition to the game is the completely re-written soundtrack, which is available for download, and which I’m listening to while typing this up. As a music fan, I pay particular attention to how music is affecting game play. Joel Nielson, the sound lead on the game, also wrote the soundtrack, and he did a pretty great job. His statement on the Black Mesa website says that this was his first attempt at writing a soundtrack, but I never would have guessed that by the quality of his work. It’s apparent that he, like the rest of the mod team, felt the gravity of their undertaking. I’m sure the long development time of the mod worked in his favor, affording him plenty of time to get it right, but get it right he did. The soundtrack does what it needs to, lending atmosphere to the halls of the Black Mesa and Lambda complexes. When the marines attack, the music picks up an intensity blending almost metal-like riffs with electronic music elements that subtly maintain the feel that this is a technology-centric sci-fi action story. The cross hair in the middle of the console image is misleading. There are two other cross hair lines that never did render properly on the console screen. It was difficult to tell if I was even interfaced with the console touch-screen. 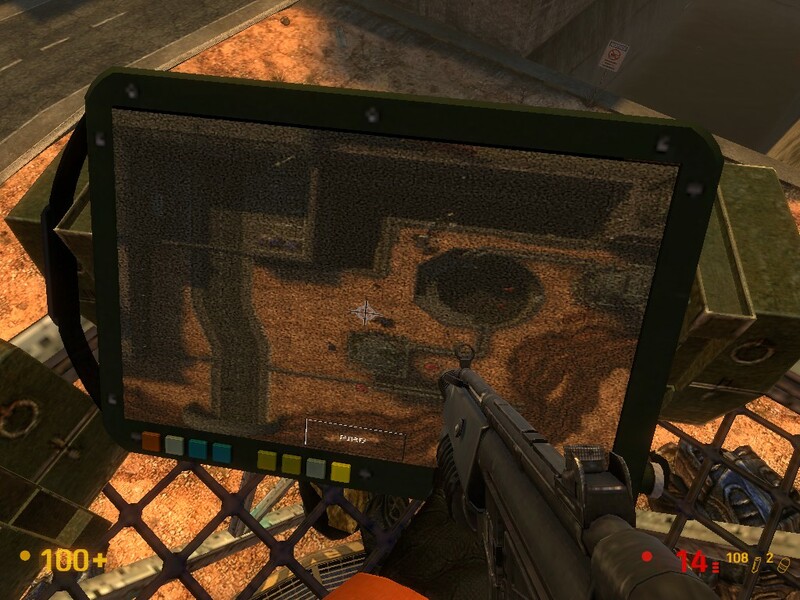 In fact it took me a while to figure out that it was even supposed to work like a virtual touch-screen at all. This was exacerbated by the fact that the big beastie was stomping around down there shaking things up. Once I did figure out how to use the console, the lack of ability to see where the cross hairs were lining up resulted in far too many failed attempts at bombing the Gargantua. This is the most glaring shortcoming I could come up in the game, which, really, isn’t much at all. I wish major game studios could have such a track record. Black Mesa is an exceptionally well-executed homage, and a great piece of neo-nostalgia. It reminds us how good Half-Life was and why Valve has become the legendary company it is. With the benefit of hindsight and experience, as well as the freedom from corporate production schedules, and combined with passion for the work, the Black Mesa team was even able to overcome some of the shortcomings of the original. The game isn’t finished yet, either. Right now, Black Mesa only takes the player as far as the leap through the portal to Xen. In the original game, Xen was probably my least favorite part. In fact, I’d sometimes play through the Lambda complex and call it done. But with as good of a job as the team has done, I’m actually really excited to see what they do with the endgame. Dave is a metal geek and is co-owner and designer for Geekazoid! purveyors of the finest in nerdy decals, buttons, and t-shirts. Follow him on Twitter @ilovegeekazoid.